Found her on the 1900 Justice Precinct 4, Hopkins, Texas census (dist 54 img 23) as Nancy Finger age 42. Found her on the 1880 Manhattan, New York, New York census (dist 674 img 13) as Ellen B. Finger age 30. Found her on the 1900 Bronx, New York, New York census (dist 1033 img 62) as Ellen Finger age 48. Found her on the 1910 Bronx Assembly District 35, New York, New York, census (dist 1608 img 20) as Helen Finger age 60. Ensign DeForest Becker, 20, navy aviator, was lost at sea Sunday night following a plane collision near the navy air base at Sanford, Fla., according to a Navy Department message received by his parents, Dr. and Mrs. DeForest Becker, of 1176 E. 29th St. He was graduated as a naval air pilot at Pensacola Training Base last Nov. 14. Born In Brooklyn, he attended Boys High School and was graduated from Stony Brook Preparatory School In 1942. He then entered Bowdoln College and later enlisted as a naval training cadet. Besides his parents he is survived by a brother, William Curtis, and his grandmothers, Mrs. Anna E. Fingar and Mrs. Edith Becker. Memorial services will be held Sunday at 4 p.m. at the Kings Highway Methodist Church, Kings Highway and E. 37th St.
Found him on the 1940 New York, Kings, New York census (dist 24-259A img 10) as DeForest Becker Jr. age 15. Address: 1176 East 29th Street. Gorham, June 8 - Benjamin Bergstresser, 56, died at his home in Gorham following a long illness Wednesday night. He is survived by his wife and three daughters, Mrs. Charles Pelling, Mrs. Charles Hunt of Gorham and Mabel at home. A son Sgt. Roy B. Bergstresser a member of the armed forces also survives and has been in the Rhodes Hospital at Utica as a result of wounds received in service in Italy. Three grand children also survive. The funeral will be held on Saturday afternoon at 2:30 from the Cleland Funeral Home. The Rev. Edgar Sabin, pastor of the Gorham Methodist Church will officiate. Burial will be in Gorham Cemetery. Found him on the 1920 Potter, Yates, New York census (dist 185 img 5) as Ben Bergstresser age 31, laborer. Found him on the 1930 Gorham, Ontario, New York census (dist 33 img 8) as Benjamin Bergstresser age 42, laborer, kraut factory. Found her on the 1920 Clermont, Columbia, New York census (dist 14 img 3) as Lillian Fingar age 37. Found her on the 1930 Clermont, Columbia, New York census, age 47. Found her on the 1940 Clermont, Columbia, New York census (dist 11-13 img 3) as Lillian Fingar age 57. Found her on the 1860 Highland, Defiance, Ohio census (img 6), as Percilla, age 39. Found her on the 1870 Highland, Defiance, Ohio census (img 21), as Percilla, age 50. Found her on the 1920 Saugerties, Ulster, New York census age 57. Found him on the 1920 Muskogee Ward 2, Muskogee, Oklahoma census (dist 83 img 8) as George Braswell age 6. Found her on the 1880 Saugerties, Ulster, New York census (dist 153 img 54) age 2. Found her on the 1900 Saugerties, Ulster, New York census (dist 131 img 24) as Edith Dederick age 21, single, living at home. Found her on the 1905 Saugerties, Ulster, New York state census (A.D.01 E.D.06 img 8) as Edith Dederick age 26, single, living at home. Found her on the 1930 Schnectady, Schnectady, New York census (dist 82 img 11) as Edith Honmel age 55. She and her husband Frank Honmel age 63 are living in the household of her brother Sylvanus Dederick age 47. Found her on the 1900 Germantown, Columbia, New York census (dist 13 img 9) age 13. Found her on the 1910 Germantown, Columbia, New York census (dist 12 img 9) age 23, living with her parents. Found her on the 1930 Bridgeport, Fairfield, Connecticut census (dist 58 img 15) age 43. The marriage of miss Margaret Fingar, oldest daughter of Mr and Mrs Peter Fingar, to Royden Snyder of North Germantown, took place on Wednesday at Blowenburg, N. J., the Rev. Claudius J. Fingar, an uncle of the bride, officiating. Found him on the 1850 not stated, Madison, Missouri census (img 107) as Benjamin F. Finger age 16. He is living in the household of Henry Rhodes, age 43. Found him on the 1870 German, Madison, Missouri census (img 17) as Benj F. Finger age 36, blacksmith. J. Gilbert Finger, highly respected and well known citizen of Saugerties died Wednesday morning at his home on Market Street, Saugerties. Mr. Finger was a son of the late Captain Henry L. Finger and like his father had followed boating for many years having served as clerk and purser on the steamboats of the Saugerties Evening Lines. He had also been engaged in the fruit and vegetable business and also as a dealer in furs. Mr. Finger was sixty-two years of age. He is survived by his wife, one daughter, Mildred, one sister, Mrs. Henrietta M. Fellows and one brother, William L. Finger. Funeral from late home on Saturday at 2 o'clock p.m. Interment in Mountain View Cemetery. 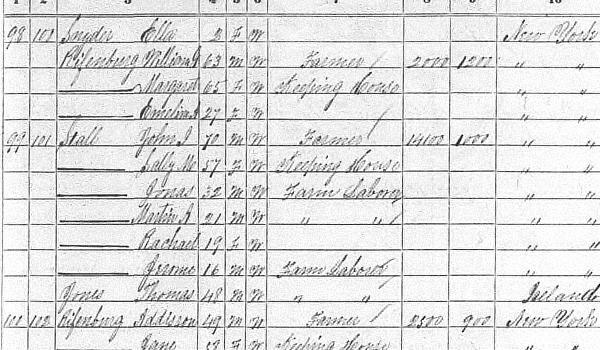 Found him on the 1870 Saugerties, Ulster, New York census (img 34) age 5, attending school. Found him on the 1880 Saugerties, Ulster, New York census (img 27), as Bertie, age 15. Found him on the 1900 Saugerties, Ulster, New York census (dist 133 img 14) as Gilbert J. Finger age 35, merchant, shoe store. Found him on the 1910 Saugerties, Ulster, New York census (dist 163 img 15) as Gilbert Finger age 45. Also in the household is Elizabeth M. Finger age 11, adopted daughter. Found him on the 1920 Saugerties, Ulster, New York census as J. Gilbert Finger, age 55. He enlisted as a private in Company E, 2nd Regiment, U.S. Infantry on 22 Oct 1888 and was discharged at Ft. Omaha, Nebraska on 21 Jan 1892. Found him listed on the 1894 Bay County, Michigan state census as Julius Finger age 28. Found him on the 1900 West Bay City, Bay, Michigan census (dist 63 img 21) as Julius Finger age 34, day laborer. Came to the U.S. in 1882. Found him on the 1910 Bay Ward 7, Bay, Michigan census (dist 47 img 10) as Julius Gustaf Finger age 44, salesman, lumber yard. Came to the U.S. in 1882. Mrs. Mary Shannon died at her home at Monterey Monday night at 9:10 o'clock after a two months illness of complications. She was 78 years old January 19. 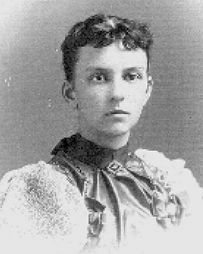 She was born at Benton Center in 1860, daughter of Philip and Sally E. Godfrey Finger. Since her marriage to Silas W. Shannon in 1877 in Monterey, she had resided there and was a faithful attendant of the Monterey Baptist Church. Surviving are: one son, Ray Shannon; two grandsons, Leroy and George Shannon; one granddaughter, Ruth Shannon; one great - granddaughter, Barbara Jean Shannon, all of Monterey; two nephews, Charles and Arthur Potter, West Pulteney street, Corning; five nieces, Nina Bessill of Watkins Glen, Nettie Scott of Hornell, Cora VanGilder of Cuba, Carrie Jacobs of Corning, Ota Dennis of Monterey; a number of cousins in the vicinity of Benton Center. The body was removed to the Carpenter Funeral Home and will be taken Wednesday to the home at Monterey. Funeral services will be conducted at the residence Thursday afternoon at 2 o'clock by the Rev. Alexander Perry of Corning, pastor of the Monterey Baptist Church. Burial will be at Bradford. Found her on the 1860 Benton, Yates, New York census (img 57) as Cecelia Finger age 6 months. Found her on the 1870 Orange, Schuyler, New York census (img 11) as Mary Finger age 10. She is living 2 doors away from her future husband, Silas W. Shannon age 26. Found her on the 1880 Orange, Schuyler, New York census (dist 150 img 20) as Mary Shannon age 20, daughter-in-law. She is married and they are living in the household of her husband's parents. Found her on the 1910 Orange, Schuyler, New York census (dist 63 img 8) as Mary Shannon age 50. Found her on the 1930 Orange, Schuyler, New York census (dist 15 img 4) as Mary C. Shannon age 70, widow. Her grandson Lewis L. Shannon age 19, teacher, public school, is living in her household. Found her on the 1910 New Orleans Ward 1, Orleans, Louisiana census (dist 8 img 18) age 8. Found her on the 1930 Dallas, Gaston, North Carolina census (dist 14 img 3) as Suella R. Finger age 6. Susan S. Fingar - tombstone. Found her on the 1860 Claverack, Columbia, New York census (img 45), age 9. Found her on the 1870 Claverack, Columbia, New York census (img 4) age 18. Found her on the 1880 Claverack, Columbia, New York census (img 5) as Susan S. Snyder, age 28. She is living in the household of her parents Jonas and Mary Fingar. Her husband, Henry Snyder age 56 is living with his brother John. Found her on the 1900 Ancram, Columbia, New York census (dist 1 img 4) as Susan H. Snyder age 48, widow, farmer. Two farm laborers are also in her household, David Lown age 57 and Isaac Haskins age 49. Found her on the 1920 Ancram, Columbia, New York census (dist 1 img 3) as Susan S. Snyder age 67, widow. Her sister, Mary A. Clapper age 71, widow, is living with her. Found him on the 1900 Saginaw Ward 11, Saginaw, Michigan census (dist 63 img 3) age 3. Found him on the 1910 Saginaw Ward 20, Saginaw, Michigan census (dist 70 img 17) age 13. Found him on the 1920 Saginaw Ward 20, Saginaw, Michigan census (dist 211 img 12) age 22, single, living at home, mail carrier, government. Found him on the 1930 Blumfield, Saginaw, Michigan census (dist 3 img 13) age 33, mail carrier, U.S. mail. Found her the 1850 District 10, Blount, Tennessee census (img 21) as Melissa Gibbs age 8. Found her on the 1920 East Cape Girardeau, Alexander, Illinois census (dist 12 img 2) as Rosa Fingers age 29. Also found her on the 1930 Sugar Loaf, St. Clair, Illinois census (dist 111 img 5) as Rose Finger age 29. Found him on the 1920 Campobello, Spartenburg, South Carolina census (dist 81 img 31) as Roy Johnson age 8. Found her on the 1880 Normal, McLean, Illinois census (dist 166 img 37) as Angie Lowrey age 7, an inmante at the Illinois Soldiers Orphans Home. Her brothers Alonso age 13 and Wallace age 10 are there also. Found her on the 1900 Elm, Pratt, Kansas census (dist 176 img 6) as Angie Finger age 25, daughter-in-law. She and her husband Fred are living with his parents William and Laura Finger. Found her on the 1920 League, Galveston, Texas census (dist 65 img 13) as Angie Finger age 46. Found her on the 1930 Galveston, Galveston, Texas census (dist 23 img 4) as Angie Finger Sr. age 55, postal clerk, post office. Address: 2115 39th st.
Found her on the 1940 Saugerties, Ulster, New York census (dist 56-67 img 16) as Maud Lewis age 49. Found her on the 1850 District 8, Warren, Tennessee census (dist 8 img 4) as Nancy Hammons age 19. Found her on the 1880 District 9, Warren, Tennessee census (dist 134 img 7) as Nancy Hammons age 49. Found him on the 1920 Fort Wayne Ward 1, Allen, Indiana census (dist 34 img 20) age 45, doctor, own office. Found him on the 1850 Benton, Yates, NY census (img 79) age 68. Also in his household is Elizabeth Shoemaker age 86, born New York. Found him on the 1930 Lincolnton, Lincoln, North Carolina census (dist 17 img 12) as Paul Reynolds age 15. In Clermont, on the 6th Inst., at the house of the brlde's father, by the Rev. J. D. Wert, Mr. RANSLER FINGER and Miss RACHEL STALL, both of Clermont. - marriage announcement, Hudson Evening Register Oct 12, 1870. Found her on the 1880 Clermont, Columbia, New York census (dist 8 img 3) as Rachel Fingar age 28. Found her on the 1900 Clermont, Columbia, New York census (dist 10 img 14) as Rachel Fingar age 48. Has given birth to 5 children, 4 are living. Found her on the 1915 New York State Census (AD01 ED01 img 4) as Rachael Fingar age 63, head of household. Found her on the 1920 Clermont, Columbia, New York census (dist 14 img 5) as Rachall Fingar age 68, widow, Head of Household. Living in the same household is her daughter Lillian, age 42. Also her son John R. Fingar, age 28 his wife Effie, age 33 and grandson Gordon, age 2 years 1 month. Found her on the 1930 Clermont (dist 12), Columbia, New York census (img 2) age 78, Head of Household, farmer, living in same household, daughter Lillian age 53. Found him on the 1880 Williamson, Wayne, New York census (dist 193 img 21) as Avery Tuttle age 18, works on farm. Found him on the 1900 Rochester Ward 19, Monroe, New York census (dist 122 img 14) as Avery W. Tuttle age 38, manufacturer. Found him on the 1930 Rochester, Monroe, New York census (dist 151 img 7) as Avery W. Tuttle age 68. Electrician, electrical supply mfg. Found her on the 1920 Burris Fork, Moniteau, Missouri census (dist 104 img 3) as Nora E. Spring age 31. Found her on the 1930 Burris Fork, Moniteau, Missouri census (dist 1 img 5) as Ethel E. Spring age 42. Father, mother born Missouri. Phyllis and Phillip are twins. Miss Phyllis World daughter of Mr. and Mrs. Fred World of Penn Yan, N.Y. and John E. Goggin, son of Mr. and Mrs. P. H. Goggin of Newton street, Fredonia, were married at 11 o'clock Saturday morning, August 2, at St. Joseph's church with the Rev. John Daly officiating. The wedding music was furnished by Miss Marion Poland, church organist. The bride was attended by the groom's twin sister, Mrs. Eugene Heary of Dunkirk. The best man was the bride's twin brother, Mr. Philip World of Pehn Yan. The bride wore a suit of blue gabardine with white accessories and a corsage of white rose buds. The bridesmaid wore a chocolate brown gabardine suit with yellow accessories and a corsage of yellow roses. Mrs. World, mother of the bride wore a flowered sheer with a corsage of white roses and the groom's mother wore green satin with a corsage of gardenias. Following the ceremony a wedding breakfast was served to the immediate families at the Colonial Inn. In the afternoon a reception was held at the home of the groom. Guests from out of town included friends and relatives from Penn Yan Buffalo, Jamestown, Mayviklle, Westfield and Dunkirk. Found her on the 1930 Pulteney, Steuben, New York census (dist 66 img 17) as Phyllis E. World age 2 years 2 months.